We are at a turning point in human development, over the last couple of centuries, thanks to industrial revolution we have expanded beyond our imagination, every aspect of our life has immensely improved. Since then we have achieved a breakthrough in industry, manufacturing, science, medicine and every other field of our lives including war. During those initial years we haven’t thought much about the consequences of that sudden industrial growth but now almost 250 years later we can see all the negativity that has piled up. At the moment we are facing a huge problem that is global warming, polar caps are melting as you read this text, every year sea level and air temperature are increasing. Some animals and plants accustomed living in their natural habitats are forced to relocate or get exterminated by this sudden change in climate. Still even 250 years later there are world leaders that deny global warming and climate changes, daily we can see photos of cities covered in “poisonous” fog and mist and people wearing masks just to be able to breathe normally. Sadly, although there are numerous initiatives coming from the UN to stop the global warming and switch to alternative sources of energy but in reality, little has been truly done. and advise you with every little detail while you are transitioning to the green side. We can tell you what is the best roof for your climate and area, or how to successfully integrate a natural rain collector, how to save money on heating bills by implementing new building materials, how to properly install windows and much more. coming from our political leaders, we at Green Energy Solutions have a bright future and not one covered in poisonous fog. So, take action into your own hands and GO GREEN today! WHY USE ECO-FRIENDLY BUILDING MATERIALS? When we founded our company and community we had one mission in mind: help the planet. We did not think much about how we’re going to do it, where do to get money, how do we reach people. It was all foolish really. However, we succeeded. And the path to that success was equally foolish and simple. We simply contacted people spreading our idea of a healthier planet, thicker wallet and so we proved our love for the environment. On the other hand, there were also individuals who rejected us right away. They didn’t see the point in what we tried to preach. They didn’t want to understand or they just couldn’t. If only we could rewind time and see how many times someone asked us: WHY? Why should I consider green building? Why should I use eco-friendly building materials? Why? And we completely understand why many people are irritated when they hear „ environment enthusiasts.“ It is close to veganism- pushy and annoying people push others even more away from something. That is why we are writing this article. We are going to give you straightforward reasons why you SHOULD use eco-friendly building materials, and we’re going to share our experience with one particular company. Sustainability is often misinterpreted lately. It became a trend that people often don’t use correctly. To live sustainably means to use materials and resources wisely. To avoid destroying resources or exploiting it to maximum, it means reuse. Essentially, the point of sustainability is to keep something for many years to come. To last for life- the ultimate and basic idea of building sustainably. The number one reason why sustainable and eco-friendly materials are so popular is that they last. And who doesn’t want a long-lasting home? Long lasting automatically means durable and durable means low maintenance. It is everything homeowners look for in just one method. Top quality building materials are bamboo, solar panels, natural fiber wool carpeting, wood, metal roofing, concrete roofing and flooring, mycelium. There are so many options to choose from. The best thing about eco-friendly materials is that they come from nature but don’t take away from it. Advanced framing techniques or optimum value engineering is the main concept of green building. To simplify it, it means to use less and get more. It is a form of house framing that uses less material and results in fully functional properties. Advanced framing techniques have countless benefits. Builders are able to cut labor and materials costs, improve the energy efficiency of your home and provide you with a more permanent house. Advanced framing is still completely in harmony with building codes. By building sustainable, you conserve energy and save money in the long run. In a bigger picture, you help the entire world save energy that otherwise simply slips through your uninsulated windows or roof. You contribute to lowering percentage of waste products in the world. Secondly, you conserve you homes energy, and therefore you save tremendous amounts of money. If you build green, you could save up to 40 percent of energy annually. Green building doesn’t just guarantee to save the world and fill your bank account. It ensures you to boost your health by improving the quality of your home. All-natural materials contribute to air quality. Materials such as natural wool, insulation, laminates and so on have green properties instead of artificial ones. Remember, natural is always healthier. We love getting in touch with different companies who build by the green principles. That is why we were thrilled to be able to sit down and talk to the staff of Georgia Roof Pro, roofing company Lawrenceville, and discuss eco-friendly materials. Georgia Roof Pro uses completely toxic-free materials. During our meeting, they explained to us how they appreciate green roofing because it is a long lasting, durable and ( from a long term perspective) affordable option. 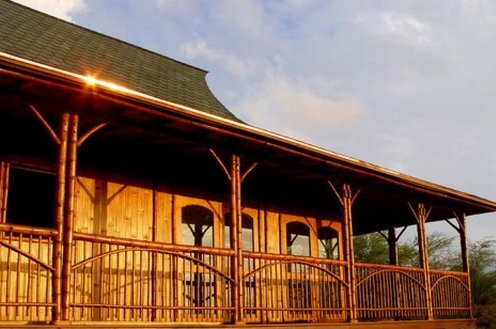 We went through their photo gallery, and we loved their slate roof category. Georgia Roof Pro doesn’t just use green materials, but they use them correctly. They build high-quality roofing systems at the best price possible. Before we write about someone, we always check their background and reviews. We can honestly say that everything we saw online completely fit our expectations. Positive experiences flooded Google reviews, and we are entirely convinced that Georgia Roof Pro can help you too in building green, energy efficient and affordable roofing system. We constantly try to highlight the importance of roofing system when it comes to energy efficiency. All the presentations and conferences we hold are aimed at improving homes and giving people information about easy sustainable living tips. Roof insulation is the ultimate way to prevent heat loss and reduce high bills. Once you insulate your roof, you won’t have to do it for the next 30 years, and the savings will completely recover the starting expense. We are going to write about most important principles of roof insulation and what you need to know about it. Keep reading these tips by best San Antonio roofing company and and find out how to save money, energy, and the Earth. Most often the situation is that people have a sloping roof and have to choose between a warm loft or a cool loft. We are going to go over pros and cons of both and how they work. It all depends on what your ultimate goal is. The situation when you insulate right under your roof means your attic space will be warm. That’s called a warm loft. A cold loft is another way of insulating. The insulation is put above the ceiling of the top floor. It makes sure absolutely no heat goes into your loft. People always state price as the number one reason why they stay away from roof insulation. However, we are here to tell you it’s a wrong interpretation. Many roof insulation options are relatively cheap. You can even take roof insulation as a DIY project. It is not as high-quality as the insulation done by a professional contractor, but it still helps. Insulation, no matter what type, makes your home energy efficient and no matter how pricey it is- it will pay off. Between the two, cool and warm loft, warm roof insulation options are more expensive. However, they provide a better protection and are better in keeping the heat inside your home. The warm loft is also usable in summer, unlike a cool loft which gets’s extremely heated on the hot days. Just like the price states- cold loft insulation is the easiest to do. It’s the simplest and cheapest type of insulation. Contractor insulates between and over joists right above the ceiling. You can even do this on your own as a DIY project. You have to find the best guides and follow them. Make sure your loft space is completely clear and ready for insulation. We recommend you to save some money and engage into insulation if you choose cold loft option. Here we come to the most important part of our article- flat roof insulation. The best way to insulate your roof is from above, and we will go over some possible ways of covering the flat roof. The flat roof is not hard to insulate, but we recommend you to call a professional roofing company. A warm roof is a way of insulating when roofers put the deck of the roof below the insulation. This way can sometimes create condensation problems. Then there is inverted roof insulating option. Insulation is placed above the membrane so that it could protect it from heat or cold. 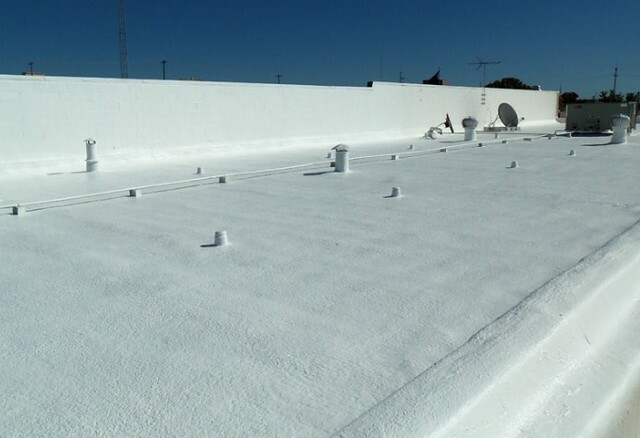 Inverted roof insulation is a great option because it protects the roof deck from tearing as well. In today’s society it’s important to make eco-friendliness embedded into our daily lives. The developed society has the ability to make up for the damage it has caused throughout the existence of the human race. Since we are well-aware of the damage we have somehow managed to cause, we are slowly working towards repairing it. More and more things are being reconfigured to gain the title of being eco-friendly. Not one aspect of our daily life is being left out. 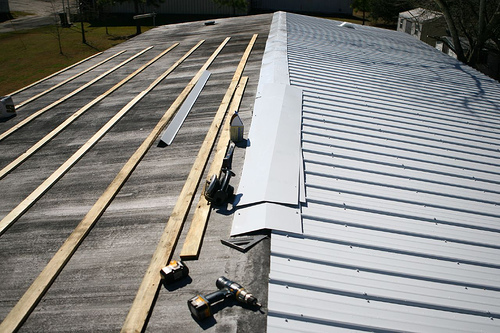 That means even the roofing industry has developed a way of utilizing eco-friendly materials and techniques. When it comes to the most common choice in residential roofing, most would agree it’s the asphalt, be it shingle or slate. That’s because it’s relatively cheap to both install and maintain. Moreover, it’s longevity is average, nothing to get worked up about but still enough to make you want to buy it. Although the trend of an eco-friendly society has been around for a few decades, there are still a lot of asphalt roofs around. However, soon enough even they should expire and adapt to the growing standards of the roofing industry. The most popular eco-friendly choices in roofing today include recycled shingles. They are most commonly seen and can be made of different materials, such as plastic and wood. Their main feature is their durability. Wood has always been a popular choice, being used in either the shape of shingle or slate. However, the main downside to using wood as your material of choice in your roofing project is the fact that it’s highly regulated in most states across the US. That’s mainly due to their immense flammability, which renders them practically useless in hot areas. Luckily, due to the advancements in technology, even that is becoming a problem of the past. According to a top roofing company in Atlanta, metal roofing systems are a rising star in the roofing industry, having transitioned from commercial to residential use. They are always made out of at least 40% recycled material. By utilizing the best metal has to offer, you can even reach a level of 100% recyclability. They are also resistant to fire, and have a high tolerance when it comes to deal with harsh weather conditions. To top it off, they can easily be placed on top of your existing roof. 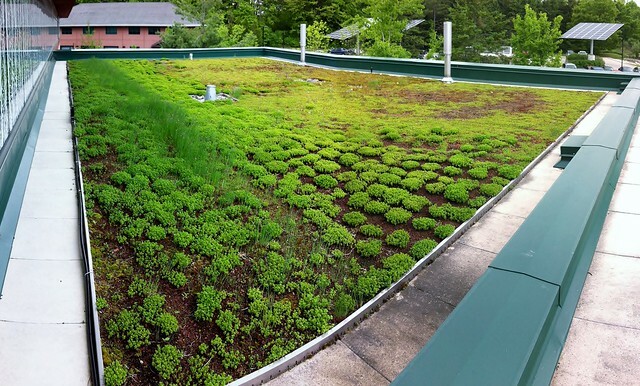 Green roofing systems are as green as it gets. They implement different types of vegetation sitting on a specially-designed membrane that has an integrated root barrier, irrigation and drainage systems. The plants collect rainwater so there’s no need to worry about leaking. Although, you should check if your foundations can take the weight of the newly-added mass of dirt. Nowadays, it’s becoming growingly important to utilize eco-friendly materials in every aspect of our daily lives. Since humanity’s grown well-aware of the climate change it has caused, more and more products are being reconfigured to fit the new eco-friendly standard. All industries are caught up in this eco-friendly revolution, and so is the roofing industry. Roofs are generally a major part of your household and can perform many functions: they can create energy if you decide to use solar panels, they can effectively lower your household bills by reflecting or absorbing heat. Moreover, they can even work on lowering your towns’ urban heat island effect, which is becoming a problem for more and more cities throughout the state. According to Kyle, owner of Savannah roofing company, the use of „green“ materials is considered to be a great investment into your future. If you’re looking for an eco-friendly solution for your roofing system, here are a few options you can consider. First of all, a green roof is a roofing system covered in various forms of vegetation. Placed on top of a waterproof membrane, strengthened by a root barrier, proper drainage, and irrigation systems, you don’t have to worry about leaking. Most of the rainwater is collected by the plants since they require them to live. Since they are usually placed on top of an existing roof, they offer another layer of insulation. That is only applicable in case your foundations can take it. Dirt and all of the above-mentioned features do weigh a lot, so make sure to check upfront whether or not your foundations can take it without collapsing or suffering any damage. 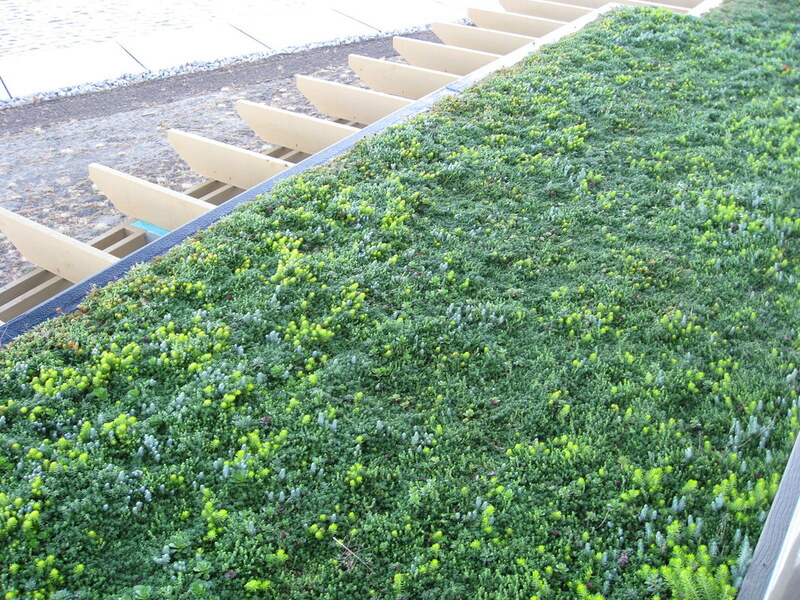 The main downside to installing a green roof is the price of its installation and the general cost of maintenance. Second of all, brown roof are becoming rather popular among many homeowners across the US. Generally similar to a green roof in concept and structure, brown roofs aim for achieving a high rate of biodiversity. Although it’s called a brown roof, it isn’t necessarily brown in color. At first, it is, but that’s just because that’s the color of the soil. Later on, vegetation usually covers it. They can provide housing for insects, indigenous plants, wetland areas for mosses and lichens and so on. All brown roofs are made of at least 40% recycled material, although with careful selection of materials, a level of a 100% could easily be reached. Brown roof don’t require a great deal of maintenance. However, you should check up on them quarterly just to make sure. Other eco-friendly options include installing a white roof, which can significantly reduce the temperature of your household by reflecting the sun’s heat. The best eco-friendly solution would be to install an all-white metal roof. Also, standing seam metal roofs are also a viable eco-friendly option. They are generally extremely durable and have a huge lifespan. Not only that, they reflect the sun’s heat and are fully recyclable. Their main downside is their price. Solar roofing systems are always a great option for someone who wants to completely utilize the sun, as the main source of fueling. Wooden shingles are always a great option to add that rustic appeal to your household but are highly regulated due to their extreme flammability. 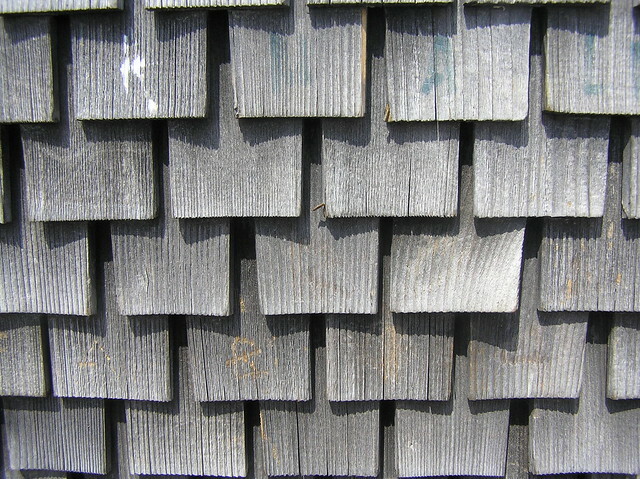 Furthermore, there are recycled-content shingle roofs, slate roofs, roof overhangs and so on. The modern urban cities all around the globe have one thing in common today; that is using concrete as a material to build extraordinary buildings. We can’t pretend that this material didn’t give us a lot to be thankful on. We have beautiful cities, beautiful skylines, bridges, sidewalks and attention catching real estates – all thanks to the concrete. But unfortunately, beauty isn’t the only thing that came with it. Concrete has a much darker side, a price that our nature has to pay. When producing concrete, we realize a ton of carbon dioxide into our atmosphere which contributes to climate change and heat island effect. What people generally still don’t understand is that there are great alternatives to this material and they are all eco-friendly. The materials we will talk about won’t comprise the quality of your desired building or construction in any way. They do have their advantages and drawbacks but always make a better choice than concrete. Acording to Oklahoma City roofing company, Green building can also be referred to as building of the future. Why? Well because it really is. The only way we could help save our planet but still allow our daily lives to function normally is building green. It is a process of using environmentally acceptable materials and ways of building; this includes the shape of the construction, construction renovation, demolition, and maintenance. Green building is a task that calls for an operation from architects, engineers, designers team and so on. It is very closely related to the natural building which is more focused on using proper materials. The first thing we want to cover is good old wood. A material that has been in use since forever is being forgotten in the modern times. Trees absorb harmful CO2 and in addition o that wood requires a lot less energy-intensive methods to implement into construction itself. It is also quite simple to work with, and you can enjoy its visual appearance. Next off, the bamboo. A traditional building material on the east. Bamboo is a renewable material so it would be great if the industry would implement it more. It’s also very light-weight and strong but still stretchy enough so you can work with it in hard-to-reach places. Because of its properties bamboo is much less expensive from other heavy imported materials. As a nation, we have been known for excessive amounts of plastic building up on our streets. Imagine if we could use all hat garbage to build our cities and houses. Imagine if we could use the old to build the new. This technique would not only decrease the amount of CO2 in the air but also reduces the weight and gives us the opportunity to find a new use for plastic waste. Another good way we could use the past to learn from it is building with straw bales. Back in the days straw bales we a normal way to build houses and honestly it isn’t a wonder because they provide insulation for both warm and cold weather and are also affordable. As a highly renewable resource, straw bales can easy replace new-age building materials as on example plaster and gypsum. Just like wood, rock structures have been around for centuries. It is the most long lasting material of all, and it’s always available. Since it’s very dense and heavy weighted, rock offers you a great protection. However, there are some drawbacks; its weight can be considered as one because its hard to work with and it takes a lot of energy to warm up a construction made from rock. We honestly hope that you have by now considered implementing some of these materials into your own real estate. Natural and green building are a simple way of improving the quality of our lives. After you build your house, it will be a big step for the environment, and you won’t even notice what a significant measure you have taken. It’s now more than ever important that we engage into saving our planet with simple actions like these are. With air pollution in larger cities and high energy costs associated with inefficient roofing systems, alternative roofing solutions are becoming more and more popular, not just among commercial building owners, but among homeowners as well. Recently we have teamed up with Anchor Roofing,Inc a Houston roofing contractors in order to adress this problem, Houston is a big city and we need any help we can get. So with their help we are going to service the Houston area when it comes to installing solar and green roofs. So what are green and solar roofs actually? Well..
One of the ways to improve the quality of life with your roof is to consider green and solar roofing. Green roofs are basically roofs covered in vegetation, which can range from small shrubs and bushes to larger park-like recreational areas. Solar roofing is a term used to describe a roof with energy harnessing panels or shingles installed. Both can be used to reduce energy costs, with varying degrees of efficiency. Green roofs can be used for a number of reasons. There are two types of green roofs: extensive and intensive. Extensive green roofs feature a shallower layer of soil placed on the rooftop, and they are used to plant smaller plants, such as vegetables and small bushes. They are also lightweight, so it shouldn’t be a problem for any building to feature this kind of green roof. Intensive green roofs, on the other hand, have a deeper layer of soil in which larger plants and trees can be planted. They require more maintenance and irrigation and are heavier than extensive green roofs. It is important to note that green roofs are generally installed on flat roofs, but they can be installed on mildly pitched roofs as well. In order to find out if your house or building is eligible for a green roof installation, you should contact your roofing contractor and find out more. Green roofs have been known to substantially enhance the air quality surrounding the building they are installed on. They also contribute to minimizing the so-called urban heat island effect which is becoming a big problem in larger urban areas. Plants are able to cool the air around them, gather air pollutants and filter harmful gasses which all contribute to the production of smog. Not only that – green roofs improve the aesthetic appearance of the city as well. By installing a green roof, you will use the otherwise useless space to add another green area to your city. 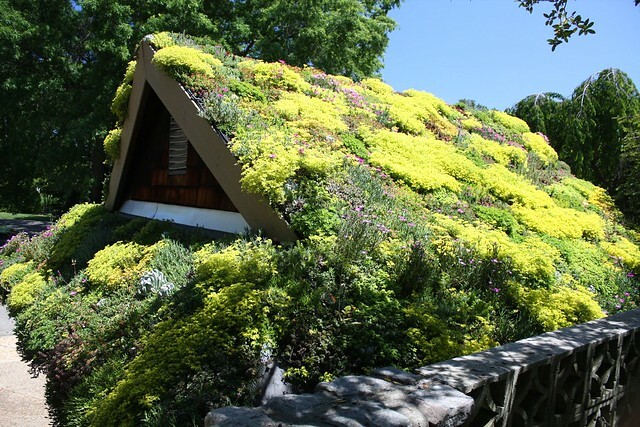 If you install a green roof, you will notice that your energy bills will keep getting lower. Green roofs have the ability to enhance the insulation of the roof, which is important in regulating the temperature inside the building. Also, green roofs contribute to the reduction of noise levels. Recreational spaces can be installed on larger buildings with green roofs as well. Parks with benches and greenery will attract people, possibly educating them on the importance of saving the environment. Not only that – your green roof will help your building gain a status among possible buyers. Biodiversity is another benefit green roofs offer. They can be home to many species, including insects and birds, especially migrating birds who can now have a temporary habitat. Green roofs can also be used for farming. A large number of cities worldwide now feature gardens and vegetable patches on rooftops, which brings several benefits. First of all, your plants are protected from intruders below. Secondly, providing you or your city with local homegrown food is very important in maintaining a healthy lifestyle. There are two types of solar roofs that you can install to your roofing system: solar panels and solar shingles. The latter type has been on the market since the early 2010s, so it is a fairly new product. It is important to know the benefits and drawbacks of each type to correctly choose what would be best for your home or building. Although they are not the cheapest money saving option available, it is worthy to consider them if you’re thinking in long term. Solar shingles are, simply put, shingles which act as electrical energy producers as well. That means you won’t have to install solar shingles over the existing ones when you’re having your roof replaced – they will simply take the place of regular shingles, which means you will save money on the amount of material. 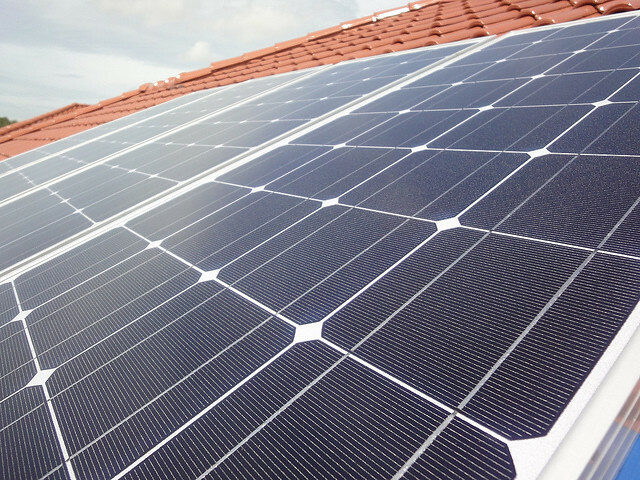 Solar panels, however, require a full roofing system before being installed. The installation of solar shingles is quite easy and quick, and it could even be done by homeowners themselves. The installation of solar panels requires more skill, knowledge, and time in order to be performed properly. When it comes to looks, solar panels can sometimes be overly conspicuous and stand out among roofs in your neighborhood that do not feature them, which can be a problem for some people. Solar shingles, on the other hand, can be made to fit any roof design and are practically invisible among other shingles on your roof. Panels can be installed on virtually any type of roof, whereas solar shingles are generally installed on fiberglass shingles, which makes solar panels more adaptable. When it comes to efficiency, they practically rank the same. Solar shingles in early production had lower conversion rates than solar panels; recent developments in technology (namely, using a material called copper indium gallium diselenide) have allowed for larger conversion rates, which can reach up to 20%, like the rates of solar panels. Finally, the cost of solar shingles is significantly larger than that of solar panels since it is a new product and it is still being developed. However, the price is changing daily and it is only a matter of time when the mass production of solar shingles will take place and allow homeowners with modest budgets to have them installed. Installing solar panels or shingles and planting vegetation on your rooftop are great ways to be environmentally friendly, to improve the aesthetics of your roof, and, what’s even more important to you, to reduce heating and electricity costs that can be a burden to your budget. Even though they can be expensive, these solutions will mean a great investment in the long term for commercial building owners and for homeowners as well.